The YMCA in Niagara Falls, New York is where Tony “Cannonball” Parisi began a brilliant amateur career, capturing championship titles in four different weight classes by the time he was only nineteen years of age. 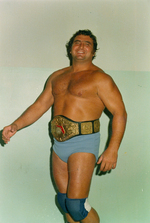 Tony used his spectacular amateur success to launch his professional career in the motor city of Detroit, where he quickly moved up the ladder to headline several professional wrestling cards. Gino Britto would become his first professional partner and together the dynamic duo captured their first professional tag team belts in the state of Tennessee. The pace of success was rapid and several Tag Team Championships followed in the WWWF (later WWF), IWA, NWF, NWA and IW Wrestling Federation and Alliances. In 1966, “The Cannonball” made his first television debut and before long he became a household name in the homes of wrestling fans throughout North America. Love soon followed for Tony and in 1968, a young girl named Chiara Vaccaro from his hometown of Niagara Falls would become his proud wife. Together, the young couple would travel the world as Tony headlined cards throughout the USA, Canada, Australia and Japan. Traveling the world was exciting for Tony but Niagara Falls is where his heart remained. In 1976, the couple returned to Niagara Falls and soon after they were blessed with the birth of their daughter, Ida. Recognizing that professional athletes have a limited window of opportunity to earn their income, Tony and Chiara purchased their family business Big Anthony’s and Niagara Family Inn, which they operated successfully for more than twenty years. 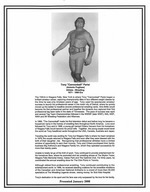 Unable to totally let go of the thrill of sport, Tony continued to provide entertainment for his hometown fans, where he promoted and ran wrestling shows at The Skylon Tower, Niagara Falls Memorial Arena, Oakes Park and The Optimist Club. For thirty years, he coordinated the annual wrestling show for The Chin Picnic in Toronto. Although retired from professional wrestling, Tony continued contributing to the entertainment world. In 1996, he received standing ovations for his incredible renditions of the Canadian and American National Anthems to a crowd of more than 50,000 spectators at The Wrestling Legends shows, raising money for Sick Kids Hospital.